From the department of silly food. Photo courtesy of Jesse Harrington. Maybe they laughed their heads off. Why did the chicken cross the centre line? Not always funny. Even a chicken can lay an egg. This chicken is a real cut-up! You should hear them cackle! 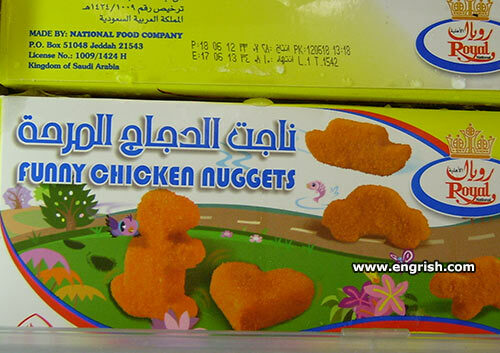 Funny Chicken Nuggets or Serious Milk Sheikh? @Yu No Hoo | 4:11 am: Because it needed to pass an egg. Just the thing if you’re in a fowl mood. My favorite: adulterer pleading for his life from the beheader, dipped in BBQ sauce. Right. The chicken always comes first. Of course, we only have; Snakes, Jelly babies, Tiny Teddies, and the like. I guess the, Department of Silly Wanks, is universal to the human race. We kill our chickens humanely. We put them through a Die-cutter. This is no mean chicken feet. It is always a source of amazement to me, that children never seem to get as much pleasure out of childhood, as adults do, out of adultery. I am related to a band of southern Gypsies. We steal chickens for Colonel Sanders. For a balanced diet, one should eat something from the four major food groups, every day. I’d like to see one in the shape of a chicken. Ahahahaha, that one thinks it’s a dinosaur! BWAH! @EffEff 1218. A Chicken Nugget in the shape of a chicken, would probably be a tautism. They’ll make you do the funky chicken. Ohhhh…so THAT’S what happened to Barney!